Commodities have made a bullish breakout, with copper the latest to join. As we stand, soybeans, wheat, gold and silver have all reached levels of overbullish sentiment. A consolidation may therefore be ahead. 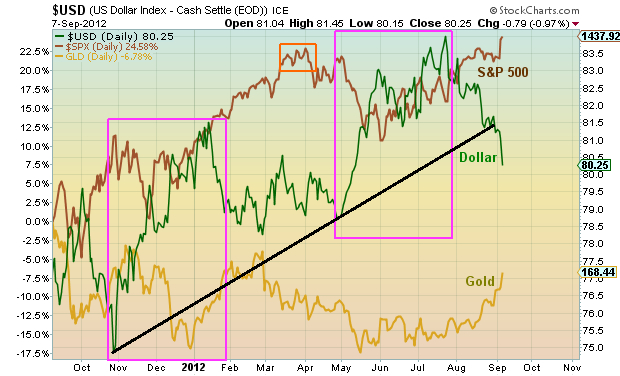 The US dollar broke down beneath rising support, and the Euro broke up. That’s supportive for commodities. 10 year Treasury yields continue to make an inverse Head and Shoulders pattern. 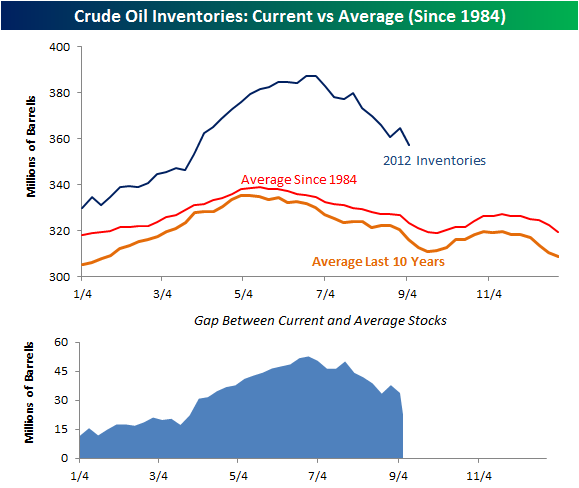 Gas and crude oil inventories continue to fall back towards their longer term averages. Although both are still out of their historical ranges, the trend in both is of a shrinking of stocks. The key question is, is the US about to roll over and join countries such as China, Germany and Japan in economic weakness (coincident and leading) or are the latter about to turn up and make for a global reflation? Conference Board and OECD data later this week will provide more clues on that, but the trends in certain key stock indices, commodities and currencies are currently pointing to reflation. Also, by solar cycles, growthflation is the norm into the solar peak – both growth and inflation – therefore a reflation would also fit. The improvement in the USA does not prevent the Fed from delivering stimulus this Thursday. It has a dual mandate and they are clearly not happy with the jobs part. The markets are anticipating QE3 (likelihood from Bloomberg indicator now 99%) and this is because the last two Fed communications have more heavily hinted towards it. I believe that QE anticipation, together with the upward pressure into the new moon, and the technical breakouts of late last week, all should support pro-risk leading into this Thursday’s FOMC outputs. What I am looking to see is, do we arrive there overbought and overbullish. If we reach those levels in stocks pre-FOMC-outputs, I will be looking to take some profits. Looking at sentiment, bullish percent over put/call ratio has a little room to move higher, compared to previous peaks, and to oscillate in that kind of region for longer. SP500 stocks above 50MA can also push a little higher, and oscillate there for a period. 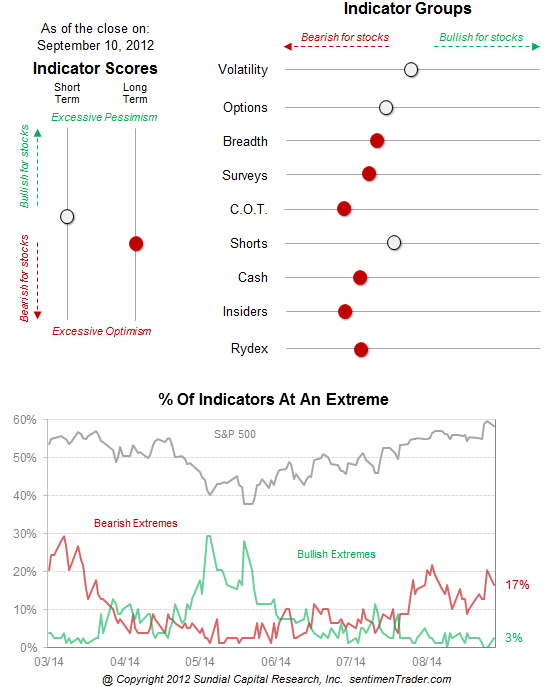 Sentimentrader indicators at a bullish extreme could also rise a little higher yet. 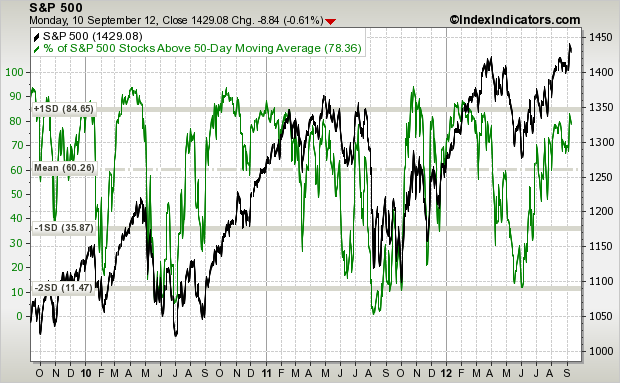 All three show stocks at bullish sentiment levels, but not quite at extremes that would signify a reversal. 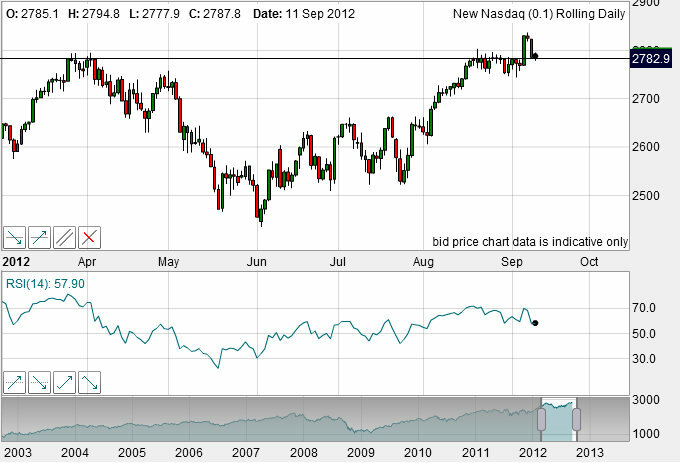 Tom De Mark’s target for the SP500 is now 1478. I suspect that by that kind of level we would see these sentiment readings at historic extremes, and combined that would make a strong case for profit-taking. …the Nasdaq reversed most of its breakout gains and is delicately poised, suggestive of either a successful backtest of the breakout or a breakdown back into the range, leaving a bearish fakeout that is the opposite of the Tran fakeout shown above. To sum it up, I am sat on my long commodities, long stocks indices and short treasuries positions, with no compelling reason to exit any of them currently. Of the three, I am still looking to exit long stock indices as priority, as per my secular/solar projections. I believe stocks will be supported into this thursday’s FOMC, and I believe the greater likelihood is of Fed stimulus at that meeting. However, given the high levels of expectation, there is the risk of disappointment and a sell-off. I am watching to see how pro-risk fares the next couple of days, and waiting for the latest global leading indicators and will then judge whether to take any profits into the FOMC. If the Nasdaq were to break down today/tomorrow, back below the yearly highs and making for a failed breakout or fakeout, I would judge that as significant, and may trim back. If on the other hand stocks push higher, the remaining US indices break up, and we hit the Demark price and sentiment extremes zones pre-FOMC, I would also be looking to take some profits. 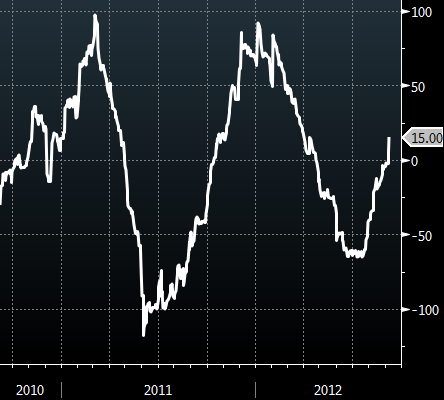 Inventory to Sales Ratio are rising and have made a new two year plus high. This should be interesting to see how this affects retail sales, the only thing this economy has left going for it, in the future. Retail sales, including food services adjusted for inflation, still remain below their 2007 high while some retail stocks are making 2000-like parabolic moves, in particular discount retailers. While the economy and the market have not been correlated since, maybe, the beginning of this rally, to believe this can continue “forever” is simply silly. It may not change tomorrow or even this year, but it will recouple just like it always has before. I want to be short retailers here. Broadly speaking, getting short the XLY and XRT. Individual names I am picking apart as well. When I see a retailer trading at 8 – 10x its book value, and its price to sales 3 – 5x greater than its peers, the writing is on the wall … the timing is not, but that’s why we trade. As the S&P 500 makes new highs, nothing is confirming these new highs. As a general example, we have yet to see the Russell 2000 and the Dow Transports follow. Also, looking at bonds, they are not telling the same story either. Not just the manipulated US treasury market, but corporate junk bonds and IG corporate bonds have failed to confirm. Looking at the Russell to Utilities ratio (IWM/XLU), is signaling, as it has in the prior years before a major down leg – that rotation is occurring, out of riskier assets and into safer plays. I am, like you John, a bull on commodities. This is where I am putting my money right now. Metals, energy, food makes all the sense in the world. And as the world population continues to grow, I’ll just stay long the things we need and stay short the things we don’t. KISS methodology. As for shorting the Treasury market, a long term chart has simply told you that the notion of stock prices rise therefore bond prices fall is simply not true over the long haul. You don’t need me to tell you that though, just pull up a chart of equities over the 10y note since the 70s. I won’t fight the Fed here. However, when the bond market does go to hell, which in due time I suspect it will, I’ll be right there with you, selling every last worthless piece of paper the gooberment prints that they call value. I am watching the economic data very closely, all the major data points plus some others I believe are important, in particular data like Inventory to Sales ratios (mentioned above) and Velocity of M2 money stock as well as occasionally looking to see where the Q-ratio lies and PE10, which both indicate equities are overvalued between 30-40% or so. Yes, I am a perma-bear on equities until we get these things to a fair valuation. I am not spending 2.3x more on buying this market than it is worth. There are many cheaper ways to go about allocating capital and expecting a better return on your money. You are very smart man RyKnow. You have not been sucked into the last gasp of the bull market and understand the fundmenetal / technical picture very well. The effort that it took you to write this post is also great to see. 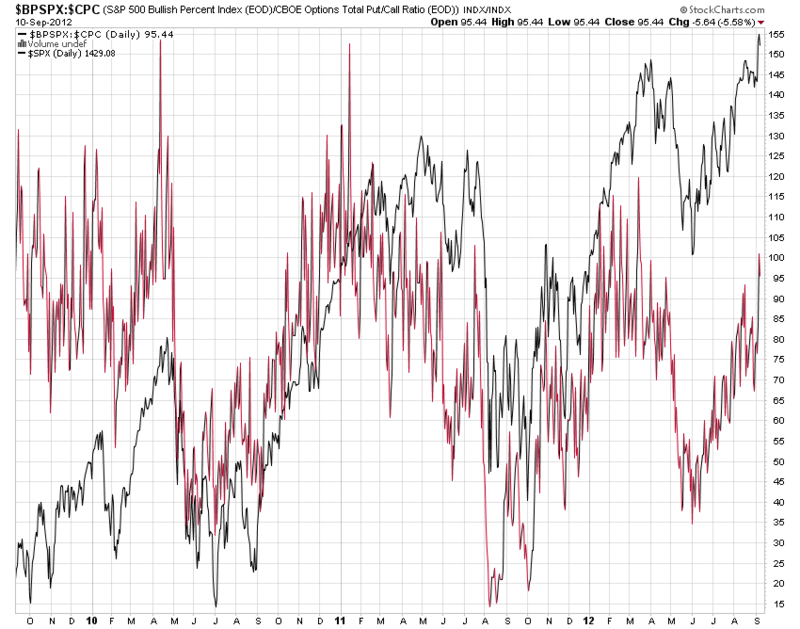 It just doesn’t make sense to say you are bullish on commodities but then on the other hand be bearish on equities. In the Modern Fed Era, stocks ARE commodities. There is certainly very little alpha to be captured. Don’t try to make it harder than it has to be. When the level of the ocean (liquidity) is rising rapidly, it lifts all boats. Not too much more to it than that. Of course this is just in nominal terms, but we live in a nominal world. In real terms, bearish arguments make a ton of sense, and are mostly accurate, but those beautifully-reasoned puts can take you for a ride all the way to zero. Ryknow -excellent thinking.Please keep it coming. I shall look for the sell signal for XLY accordingly. Many thanks to John our host. I want to make one other point that I have made in some other post that goes along with the markets price momentum (and then I’ll have said my bearish piece in full). In a nutshell, momentum is dying and dying fast. The two data points I have been looking at are stocks above their 200-day moving averages and the length of the rally’s in the S&P 500. First, going back to the beginning of this rally (March ’09), while the S&P 500 price has been making higher highs in each one of its legs, the number of stocks above their 200-day mov avg has not. In fact, it has been making lower highs. I am not speaking of stocks just in the S&P 500 index, but overall (NASDAQ, NYSE). This is a bearish sign and it does appear that we may have topped out in the recent leg up at 65% of stocks above their 200 day ma. Secondly, the length of each rally has had an interesting pattern. Going back to March 2009, it had around a 13 month leg higher, from March 2009 to April 2010. We then pulled back only to have another leg up, which took a period of 9 months, from July 2010 to April 2011. We then corrected again, and again made another stab at new highs, rallying for 6 months, from October 2011 to end of March 2012. Again, we corrected and now are at a 3 month period where we put in new highs but are struggling at these levels. I am not saying that this some magic number (13, 9. 6, 3, etc) but more importantly the length of each rally is compressing in time, and with that said, the differences in the high of each leg in percentage terms is compressing as well. A compression in time and price percentage difference of each new high prior to a pullback is showing internal weakening in the markets. The final point is this: ask yourself in which direction is it the easiest for the S&P 500 to move in over the next 10%, or in other words, is it easier to see the S&P 500 10% higher from its current level, which would take us back to the all time nominal high, or 10% lower, which would take us back to the end of May of this year? Absolutely easier to see it 10% higher. I suggest looking at a chart, and not the thick carapace you have built around your ego to protect it from the possibility of being wrong. I could be wrong. Never said I wouldn’t be. No ego, just facts as I presented them on a bearish view. If you looked at a chart, you’d see the same thing I posted, but of course you’d rather just try to insult me rather than present a valid counter-argument with facts and data points. Typical. And it just makes more sense that we revisit lower levels since we were just there rather than getting above levels we haven’t seen since 2007. Oh but that’s right, liquidity is answer… keep thinking that way, I’m sure it can never be wrong. With regards to your earlier post, yes, commodities and equities have been moving together. But you’d be the same person just a couple of years ago who said we couldn’t be at 150bp on a 10 year with the S&P heading to revisit all time highs. And yes, I’ll wait for your argument about how bonds are manipulated by the Fed and equities trade in a free market. Tool.